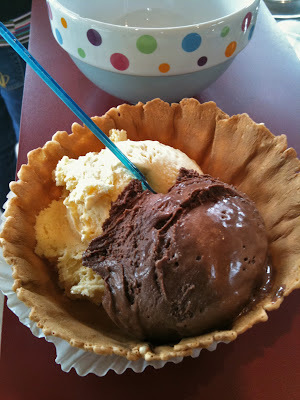 My picks for ice cream, gelato, in and around Seattle. Yours? 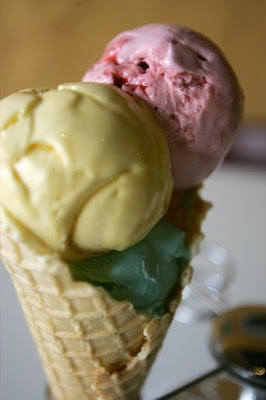 July is National Ice Cream Month, though ice cream — and its Italian cousin, gelato — are a treat adored year ’round. Can’t you hear the screams, for classics like West Seattle’s Husky Deli, Maltby’s Snoqualmie Gourmet and Redmond’s Theno’s Dairy, and long-loved gelaterias Procopio, Gelatiamo and Bottega Italiana? Frozen-sweets fans follow Half Pint, Empire and the Whidbey Island Ice Cream Co. to local farmers markets, and chase trucks from Molly Moon’s and Parfait by following them via Twitter. Meantime, I’ve made the rounds in search of creamy, handcrafted cool, with stops at local shops profiled (here) for this month’s Ticket roundup. And to complement that seasonally inspired caloric workout, allow me to take you on a tasting-tour of the places mentioned therein. Hey! Stop licking the screen. A waffle cup at Mora Iced Creamery (left) with three shops on the Kitsap Peninsula, and a waffle cone at Fainting Goat Gelato in Wallingford [Fainting Goat photo by Seattle Times photographer Joey Anchondo]. Taste-testing is part of the fun, and after waffling over which flavor I had to have at Mora in Kingston (walking distance from the ferry terminal) I zeroed in on sabayon and dark chocolate mint. Then I ate the whole thing while walking back to the ferry in time to catch the boat home to Edmonds. Adult walk-on ticket for the ferry (seen down the street): $6.90. Umpteen free tastes and two enormous scoops in a waffle cone: $5.65. The look on your outtatowner’s faces when you take them on a boat-and-bloat ride to Mora in Kingston (look for the flag, seen at left) or Bainbridge: Priceless. 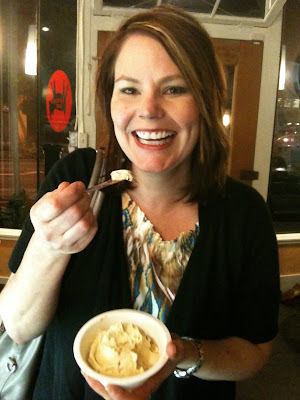 At Wallingford’s Fainting Goat Gelato, my gotta-get-it flavor is the tantalizingly tart non-fat-yogurt gelato. It might not be as colorful as the trio on a cone shown way up top (filled with blue angel and creme brulee gelato topped with blueberry pomegranate sorbet) but did I mention it’s made with non-fat yogurt? Which makes me feel a little less guilty eating it. But only a little. You never know who you’re going to run into when you’re hanging out in Wallingford on a Tuesday night. 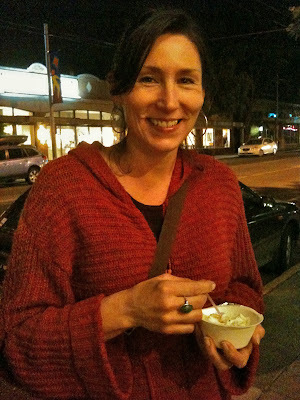 When I stopped into Joule, solo, for a bite to eat, I ran into my pal Becky Selengut (remember her?). She was happy to introduce me to her crew of gal-pals — who’d just worked their way through Joule’s menu. When I offered to buy everybody dessert next door at Fainting Goat, there was nary a “no.” And among that posse of pretties were these familiar faces. Chefs night out: among Becky’s crew was Lauri Carter (left). You might know her from the original Matt’s in the Market, her late restaurant Moxie, or her current gig at Harvest Vine. And that’s Ba Culbert (right), who’s cooked at the Palace Kitchen, Vios and the Ruins and today is owner/chef at Tillikum Place Cafe. 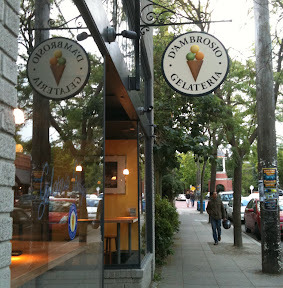 A few weeks back I told you about Ballard’s new gelateria, D’Ambrosio, where I ate the most amazing pistachio gelato I’ve ever tasted, though there are many other equally delicious flavors dished-up by charming owner Marco D’Ambrosio. Marco (scooping, right) and his dad, Enzo, run the show here in old Ballard. The time’s always right for Full Tilt — the ice cream parlor and vintage game-stop that got its start in White Center, thrills ’em in Columbia City and offers a tiny outlet in the U-District. Though if you’re smart you won’t show up on Mondays when all three shops are closed. If you didn’t know the U-District shop was here, you might miss it. It’s just off the Ave at 50th and Brooklyn. Follow the sweet scent of waffle-batter to the tiny spot behind Cedars restaurant. The line was out the door when I arrived a half-hour earlier. At Full Tilt I sampled aplenty. I was impressed with the sweet buttery flavor of the purple Filipino favorite ube (made with sweet yam) and the vegan-friendly green tea ice cream (the “cream” comes from coconut milk). But I’ll be back for the Mexican chocolate concocted with strong hits of cinnamon, which has been one of my favorite ice cream-spices since my Philadelphia childhood, when I learned to love Bassett’s justly famous cinnamon ice cream. That Mexican chocolate was so good, I had to take a pint home. 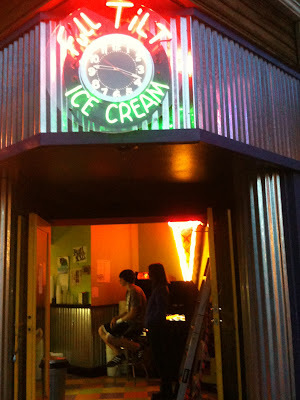 $5 buys a full-up pint at Full Tilt, and they’ll fill it with several flavors if you want. 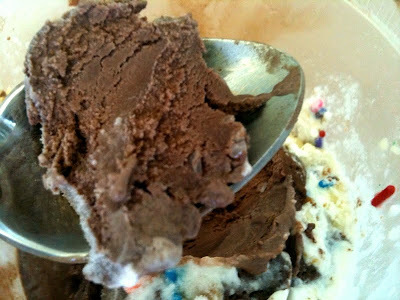 I also got some “birthday cake” ice cream, complete with cake, icing and sprinkles (or “jimmies” as we called them in Philly) for Nate — who celebrated his birthday the next day. The kid liked it. But not half as much as he liked the ice cream he helped make last summer at “Made From Scratch” cooking camp. The beet was great. 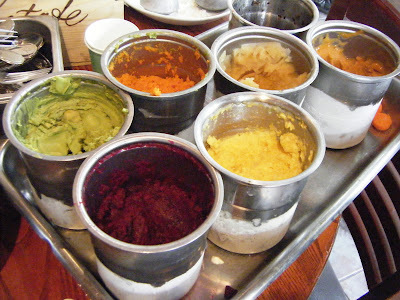 Ditto for the carrot, though I’ve got to say my favorite was avocado. Yes, avocado. And if you think that’s weird, you haven’t read this. So, tell me: When you put your money where your mouth is, where do you go to chill?